With his goofy smile, sleepy eyes, and stoner's laugh, Jim Breuer might not appear to be the most introspective comedian out there. The fact that he made his mark playing Goat Boy on Saturday Night Live and a recalcitrant toker in the stoner classic Half Baked doesn't help his reputation at all. 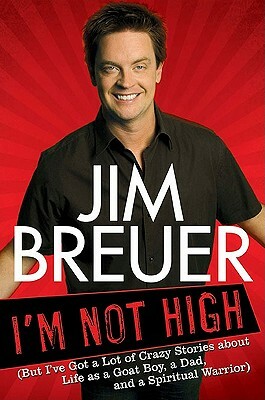 But in I'm Not High, we meet a whole new Jim Breuer: the Jim who tours the country with his whole family in tow; the Jim who cares for his ailing eighty-five-year-old father; the Jim who considers himself a deeply spiritual person. I'm Not High reveals the complex man behind the simpleminded persona, bringing to life true stories from a career that has spanned two riotous (yet somehow semi-righteous) decades. Jim dishes on everything from the SNL years to his early adventures in film. The cast of characters in I'm Not High includes Chris Farley, Dave Chapelle, and Tracy Morgan-who all taught Jim lasting lessons about the high-stakes game of fame. He also chronicles the constant role his family has played in keeping him honest. Whether he's arguing with his wife about religion (Is it okay to believe in God but not believe in church? ), trying to take care of his kids, or helping his father get through the day with his dignity in tact, it's clear that some of his best material comes from his best moments as a son and a dad and a husband. Stand-up comedian Jim Breuer was part of the Saturday Night Live cast from 1995 to 1998. He now hosts two popular Sirius/XM radio shows and recently screened his documentary, More Than Me, at the Just for laughs comedy conference in Montreal. He lives in New Jersey with his family.